It's the end of March, and it's time for another New England Aquarium aerial survey team to say our goodbyes. Of course, after months of atypically cold and blustery weather, just as things warm up and northern Florida becomes an extremely pleasant place to live we all must go our separate ways and leave our sun-filled field house and these bright blue waters to the summer vacationers. But while most people who visit Fernandina Beach will come for the tourist season, we tapped in to a much less-known but none-the-less critical draw to this area: the right whale calving season. The 2009-2010 season has come to a close with a total of 19 mom/calf pairs being documented on the calving grounds. The end of the season feels a bit abrupt in contrast to the slow way we got started, fighting off winter storms and waiting for the number of new right whale mothers to inch higher and higher. It has been a fitting final week of flights in our trusty Skymaster. 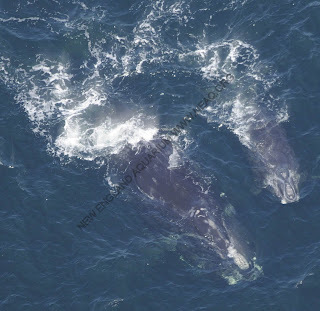 We are having fewer and fewer sightings of right whales, which is a good thing. Mothers are slowly ushering their calves out of these shallow waters, now that they are big enough to make the long journey back home. This sighting of #2642 and her robust calf on the 26th of March is surely one of the last before researchers see the pair again, hopefully unscathed by the obstacles that they may face between these southeast calving grounds and the Bay of Fundy. It is awesome to be witness to the transitions throughout the season. On our final days of flight the oceans were bursting with life, and we even saw 9 massive leatherback turtles in one survey, the dark ridges on their shells obvious from 1000 feet in the air. I saw some amazing things this season that I probably won't see again, like an enormous great white shark moseying along and an alligator more than 20 miles from shore, but I think my most meaningful experience was when I was part of a special opportunity to mitigate ship strikes while Suzie and I circled above a whale and her new calf who had decided to hang out in the Jacksonville shipping channel. It's wonderfully energizing not only to protect such a critically endangered species with the immediacy of watching a ship maneuver to avoid the whales, but also to see this incredible system that has been set up to protect these whales work. Before coming to the southeast, I was unaware of the extent to which so many people will willingly put forth all their efforts to protect a special species. My work here has given me a new optimism about the future of the oceans. Please rememember that we will be back and Blogging during our summer field season in the Bay of Fundy in August.